corrupted. Otherwise known as the Timeline corruption hypothesis, now to begin. In Der Riese, there is a radio that mentions the activation of a shield, although probably just meant to keep the zombies from breaking out, I think it could be more advanced than that. It could be a temporal shield, that ultimately time locks Der Riese. When the gang arrives, the power is shutting down, and that probably means Der Riese is synchronising with time again. However, it appears to be in some kind of quantum loop, as the clock keeps resetting itself. So the effects are still there, it's just unless the gang were able to restore the shield then inevitably the horde would be unleashed. Now one way to break a temporal shield is by tearing apart space time. And thanks to the Wunderwaffe DG-2, that very thing happened. Therefore, allowing the horde to be released from the Giant, and ultimately dooming our future. Now this isn't the first example of Time travel. I believe the Germans of 935 and the Russian Ascension Group were collaborating across time, through time travel, thanks to Lorentz Transformation. Lorentz Transformation is - the Lorentz factor, gamma, is a pure number, comparing the time of travel of light under two models of physical reality -and it is not necessary or correct to use either a square root or a division by two in calculating this factor. B: A aspect of Group 935 who may have been aware of Maxis' blueprint for the weapon was relocated at the Ascension Facility after the war, and thus integrated into Ascension Group. Thus allowing Gersch to build his own weaponry. The same way they go from Der Riese to Kino is most likely how they got to Ascension, via overloading the teleporter. 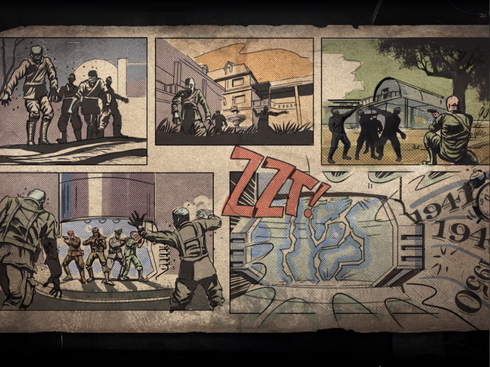 As for how they got on the lander at the beginning, it could be another aspect of Richtofen controlling their minds, and suppressing certain information. The focusing stone Easter egg involves going back in time to safe two explorers, how once the egg is complete. Time resets itself. Another example of a permanent loop. I haven't played this map I'm afraid so, I can't comment too much on this area. But I will point out the comic strip. The way it looks to me is that the fabric of reality is being torn apart, in some ways. Or that another temporal crack opened, hence how they end up at the Moon. Have you ever researched anything along the lines of Quantum-Jumping? 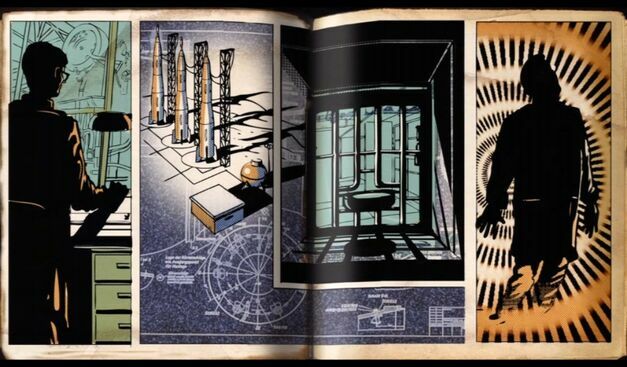 And notice the Kino Der Toten comic book strip. Bump. This is one of my favorite topics. What a great theory this was. This would explain the odd "Kino" note, written in 1975. It may alsof explain the Illuminati symbols in both Kino and the Baikonur cosmodrome. Illuminati symbols in the cosmodrome?